A review of “The Night Cafe“, a mixed reality piece, created by Mac Cauley, with soundtrack,”Soft as Velvet” by Paul Mottram. I watched it many times . Its bold vivid imagery deftly brought a sequential gallery of Van Gogh’s paintings to life, in an interactive journey through the rooms of his home, and local cafe and bar, and ended in his bedroom. It opens with the brilliantly coloured, Night Cafe, oil painting, which immediately sets the scene by inviting us into the visual cornucopia of swirling rich reds, brilliant blues, and sombre greens. 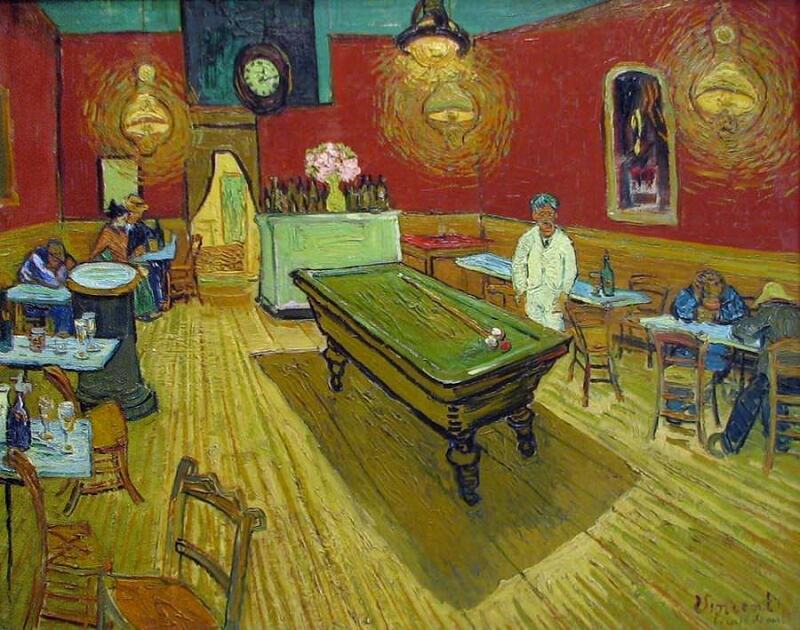 We are invited to partake of a beverage, entreated to play billiards at the pool table, walk past the pianist, who is playing a tuneful ballad, and entreated to join Van Gogh in conversation, and engage in pipe smoking. It is a gentle and melodious transition from the outside world, into that of the artist. We are not merely observers of his work, but are participants in his world. The whole immersive element is delivered, via our journey through the night cafe. His sunflowers painting is evident in the still life placed on top of the piano. Further reference to his work is delivered by Van Gogh himself, sitting on the bench, smoking his pipe, and references a series of his still life portraits, specifically, I feel, his ” self portrait dedicated to Paul Gauguin“. His presence is further referenced, with an amalgam of several of his self portraits, eg: both of the ” Self Portraits with bandaged Ear ” of 1889, where he sports a similar small beard, has a gaunt face, and is smoking a pipe in one . The viewer is invited in via a window or fish eye lens, into the space, which solely embraces the viewer. You are asked to join the journey as a viewer, in an intimate context, like an old friend meeting and greeting the subject. The camera pans in and out, focusing on various aspects of each painting, and there is a constant thread running through each scene, ie of the lights shining, twinkling more and less brightly, whether they are the artificial lights in the cafe, or those of the night sky. This panning in and out is also effective in giving the characters a sense of animation, and movement, whilst still embracing the true, painterly nature, of the work. Included in the mixed reality piece are the pre production sketches, which I also found intriguing to view, and expansive and informative, in my understanding of the piece. The use of the moving camera in the production of the piece works most effectively, as it invites the viewer to participate in the journey, thus wholly immersing oneself in it. Many of his other paintings are featured throughout the immersive piece. 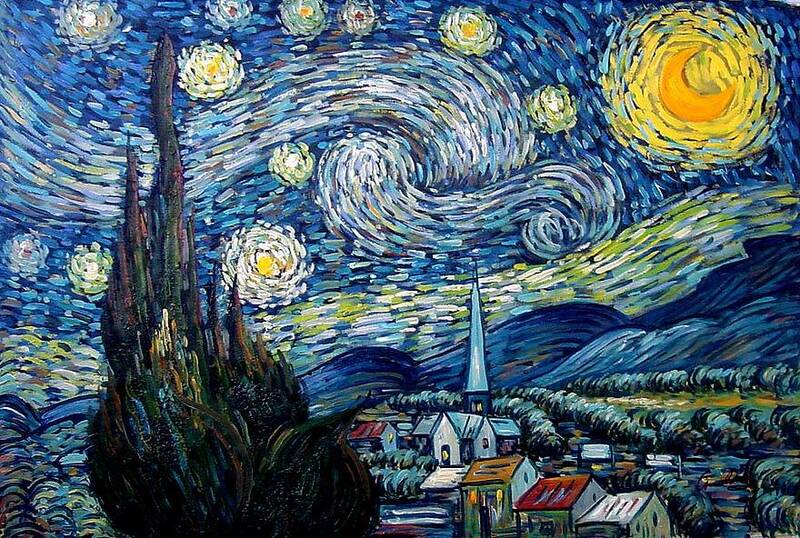 “The Starry Night” is highlighted with the suggestion of the night sky, and by the ongoing constant reference to light sources, either artificial or natural. “The Bedroom Painting, is indicative of the placement of the chair in his room, and it plays a pivotal role in the interactive experience as you are taken towards it, invited to sit in a clever manipulation of scenes, sounds and visual imagery, all whilst being made to feel that you are actually walking through the room with, or as Van Gogh. It totally immerses you in the experience and wraps and envelops your senses in a visual and auditory embrace. The strength of colour, the journey through his paintings, the complimentary music, and the essence of being one with Van Gogh embrace the viewer sympathetically. All instil in one a peaceful, harmonious, evolutionary ,organic transition, through his work. Rather than display him as a fractured genius and tormented soul, the experience is a harmonious, visually embracive, and tranquil one. It cleverly captures the powerful colour palette of his work, embraces the auditory senses musically, invites the viewer to join Van Gogh in the cafe, and takes you home to his bedroom whilst engaging with your visual senses and mind participation . You are invited into his life through the clever manipulation of his world through his paintings .